Microsoft Surface, which once accounted for a $900 million charge for the company, has grown into a stable business that showcases the company's software. In the dim light of a New York event space, a video announcing the newest version of the Microsoft Surface laptop was playing loudly, projected on a huge screen to a crowd of analysts and media. Surface chief Panos Panay was hardly paying attention, instead roaming through the audience, inspecting the various Surface devices being used by scattered audience members. Panay, Microsoft’s chief product officer, picked up a few of the devices, taking a quick look at cases and accessories and noting the product models. 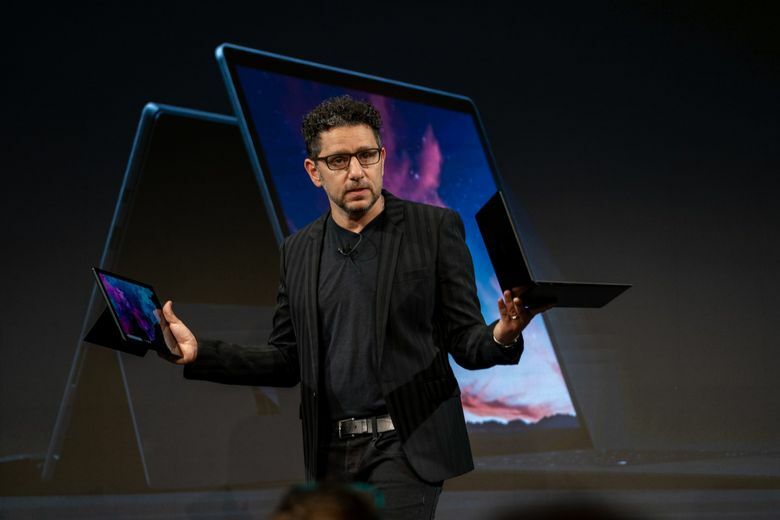 The Surface line of devices — ranging from hybrid tablets to laptops to massive touch-screen whiteboards, and the only major hardware line made by Microsoft besides the Xbox gaming console and HoloLens augmented reality headset — has been Panay’s daily work for more than six years, and he was intent to learn how each person uses theirs, from the teacher in the audience to the reporter. “I’m inspired by products and people, but the collection of people coming together is super emotional for me,” he said at the early October event as Microsoft announced small evolutions of the line — new versions of a few Surface products, and a pair of Surface headphones. Surface got off to a rocky start at Microsoft after its 2012 launch, but it has survived while another hardware effort that started around the same time — a Windows phone — fizzled. 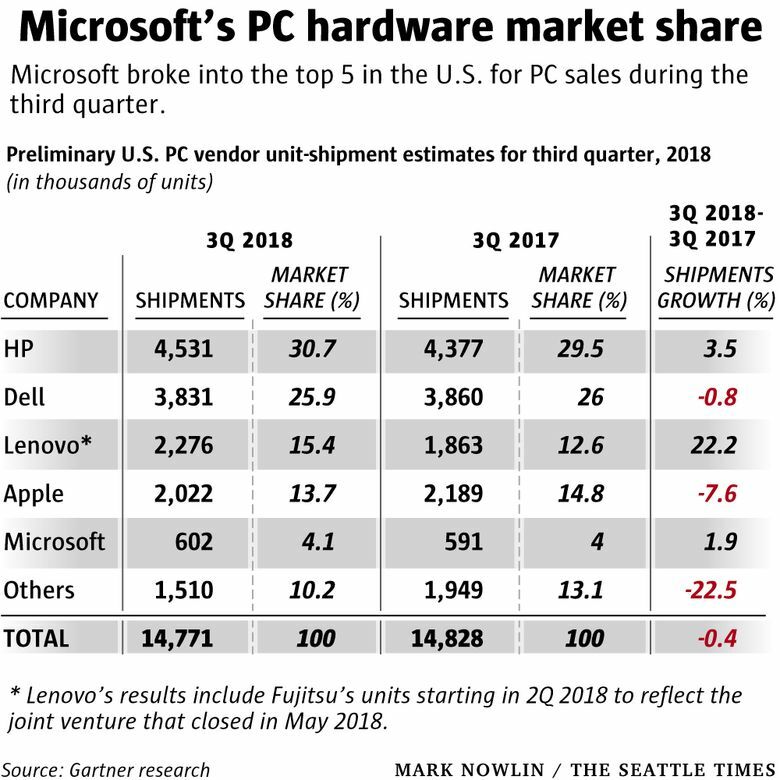 Microsoft has continued to invest in the Surface hardware — linking its development closer to its software efforts — and gradually Surface sales have increased, especially in the last year, with the line carving out more space for itself among leading PC makers. At the October event, Panay was undeniably excited about the new models, which he said took into account huge numbers of suggestions from customers. He also acknowledged that the Surface trajectory has not always been smooth. In the line’s second year, Microsoft took a $900 million charge related to the early Surface RT, and the tablets are consistently outsold by big competitors Apple, Amazon and Samsung. But Surface revenue has also increased steadily for the past five quarters and Microsoft, even though it has transformed itself into a business increasingly focused on cloud-computing technology, remains committed to the hardware line. Chief executive Satya Nadella has thrown his support behind the Surface hardware, just as he did with Microsoft’s Xbox division, even when some critics expressed skepticism. A big reason for that commitment to Surface, some analysts say, is that the devices allow Microsoft to present a premiere version of its software and hardware in one. The company can showcase everything from its own operating system and workplace software on its own hardware, something it can’t completely control when it licenses its software to other device makers. It also allows for new services such as Microsoft Managed Desktop, which gives companies Surface devices preloaded with Microsoft 365 and access to an IT help desk. It’s designed to make it easy for companies to buy (or in this case, lease) devices and keep them secure. It also encourages workers to use and stay on Microsoft’s cloud. “It’s this broader strategy that’s not just about this device,” said Forrester analyst Andrew Hewitt. At the same time, he said, Surface devices have started to take over some of the tablet market from Microsoft’s entrenched competitors. An August report from research firm IDC shows Microsoft has yet to break into the top five tablet makers by market share, remaining behind Apple, Samsung, Huawei, Lenovo and Amazon. But if the hybrid devices are viewed more as laptops, especially since they come with keyboards, Microsoft edges its way into the top five. According to Gartner’s latest estimates for U.S. personal-computer sales — which include hybrids like the Surface devices as well as laptops and desktops, but not the popular iPads or Chromebooks which fall into a different tablet category — Microsoft sold 602,000 units during the third quarter, making up 4 percent of the market. Microsoft reported that its Surface sales during the quarter ended Sept. 30 increased 14 percent from a year ago. That follows a company report this summer that Surface sales increased 16 percent, or $625 million, during its last fiscal year. That would come to annual sales of about $4.5 billion, though Microsoft does not break out specific Surface sales numbers. The numbers underscore how Surface has changed over the past six years. At the beginning, Panay said, the Surface development team was creating hardware to wrap around Windows 8 software that had already been developed. “It wasn’t about the company coming together, it was about making hardware for stuff the company had already built,” Panay said. That changed under Nadella, who took the helm in 2014 and has become known for breaking down some of the traditional silos within the business. Now the company leadership comes together to consider how Surface fits in to Microsoft’s overall strategy, Panay said. “It’s about senior leaders coming across the company and believing in and building one product,” he said. One outside tech CEO cast doubt last year that the Surface line would still be around by the end of 2019, saying Microsoft would instead narrow its focus to cloud computing and software. But most others disagree. It may not be the market leader, but the Surface hardware line, and especially the hybrid tablets, are changing the way people use PCs in an increasingly mobile society.